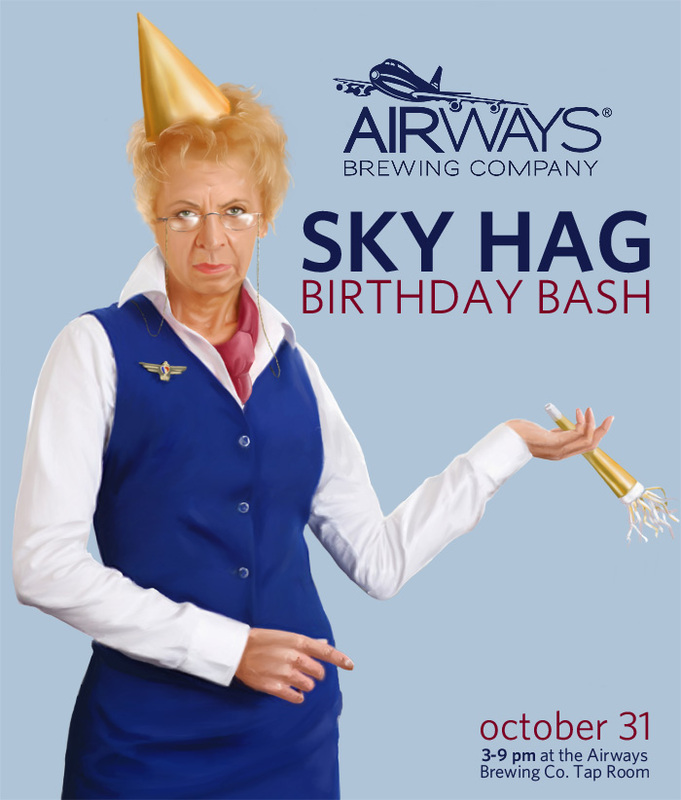 Fresh off the release of their first-ever bottled beer: Final Departure Imperial Stout, Airways Brewing out of Kent, WA is now set to release their flagship and most popular beer: Sky Hag IPA in 22oz bottles on its second birthday. Fall is a great time for hopheads in the Northwest. It’s harvest time, so we get all the great fresh hop beers filling our taste buds with all that amazingly fresh hoppy goodness (and I must say that Fremont Brewing‘s Cowiche Canyon Fresh Hop was my absolute favorite this year), the annual Hopfest at Brouwer’s Cafe and the Yakima Fresh Hop Ale Festival. Then, as if that weren’t enough, we get both Hoptoberfest and the IPA Cask-O-Rama from Beveridge Place Pub. What more could a hophead ask for? It’s IPA season at Beveridge Place Pub. Hoptoberfest and the annual voting for their house IPA has been going on since October 4th. It all started with over 18 different IPAs on tap to choose from. 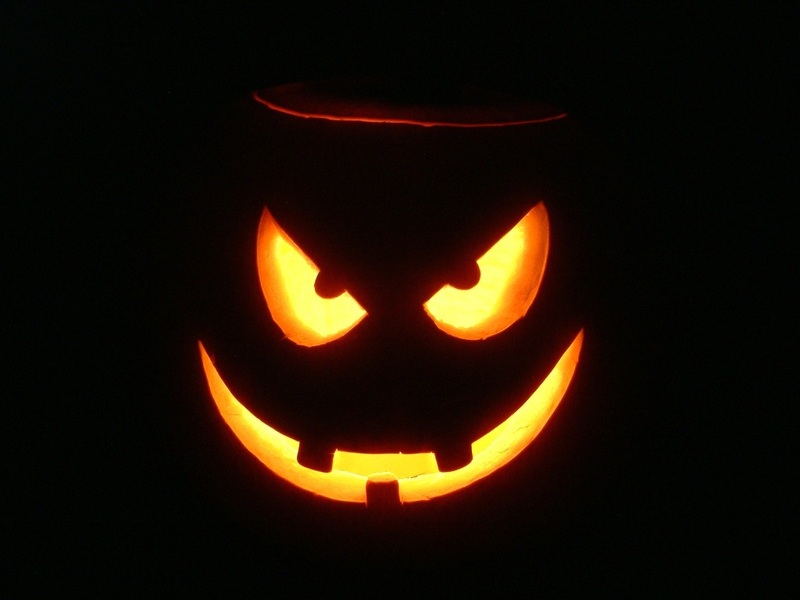 Patrons are allowed one vote per person per day throughout October. By the end of tomorrow, 10/24, it will be paired down to the top eight nominees. Then on Thursday, October 25th, you can go in for a blind tasting of the top 3 nominees. Final voting begins on that date to determine which IPA will be Beveridge Place Pub’s house IPA for the next year and ends on November 4th. The winning IPA will be announced at the start of Beveridge Place Pub’s annual IPA Cask-O-Rama, which starts on Thursday, November 8th. 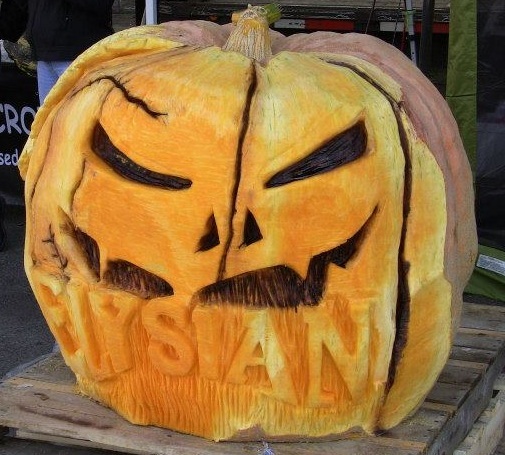 This past Friday and Saturday, October 19th and 20th was the 8th Annual Great Pumpkin Beer Festival at Elysian Brewing‘s commercial brewing facility in Georgetown. The festival was held in three sessions: one on Friday and two on Saturday. I attended the 1st Saturday session with my wife, Lynn. The gates opened just before 11:00AM for this sold out event and, by about 1:00PM, things were getting pretty crowded. The festival was arranged with eight pouring stations (2 inside and 6 outside) each pouring a different selection of pumpkin beers to try. I grabbed my taster glass and tickets, including a few extra tickets for $2 each, and headed off to start sampling. There were several pumpkin beers from Elysian brewing, along with selections from across the state, across the country and even one all the way from Norway. I knew I wouldn’t be able to try every offering, so I relied on word of mouth from a few friends, including fellow beer blogger Brew Dad, and my own curiosity to lead me towards my first few selections before the lines for each tap station began growing too long. It seems like it wasn’t long ago that Joel VandenBrink, originally from Holland, decided to follow his passion for brewing and start Two Beers Brewing Company in a Seattle garage. I can hardly believe it’s already been five years. Today, Two Beers Brewing operates out of its 4,800 square foot brewery and taproom in Seattle’s SoDo district and creates 12 different beers, including five year-round, seven seasonal and a smattering of small-batch infusions including Jalapeno-infused Evo. IPA and Lime Ginger-infused Panorama Wheat. If you’re like me, you weren’t able to make it to this year’s Great American Beer Festival happing over the next three days in Denver, CO. It’s been difficult reading Facebook and Twitter posts from those I know who are there enjoying themselves, but there’s some consolation to be found right here at home. Here are a few craft beer related things you can do right here around the Sound this weekend. Washington is well known for beer festivals. 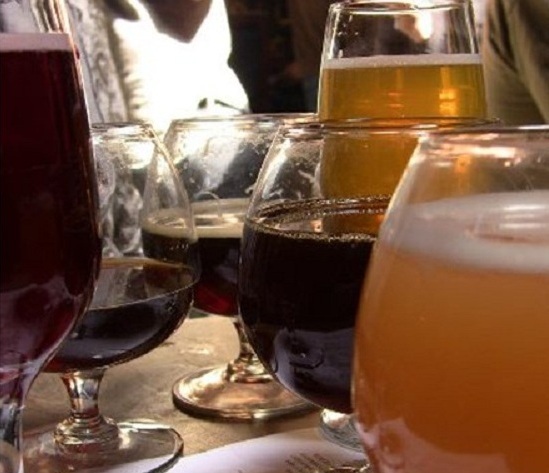 We have the Washingon Brewer’s Festival, Belgianfest, the Everett Craft Beef Festival, Sour Fest, the Hard Liver Barleywine Fest and many, many more scattered all around the Seattle area and across the state. Well, I hope you have room for one more on your craft beer calandar, becuase coming up on Saturday, October 13th, 2012 is the first annual B-Town Brewfest – the Seattle area’s newest beer festival. Proceeds from this festival will go to benefit Seattle Children’s Hospital. The festival will be held at the Burien Community Center (14700 6th Ave SW, Burien, WA), and will be divided into two sessions. The first is from 11:30AM – 3:30PM and the second will be from 4:30PM – 8:30PM. Tickets for the festival are $25 in advance or $30 at the gate. Advance tickets are available for purchase now through Brown Paper Tickets. You can also CLICK HERE to sign up as a volunteer for the festival. Your ticket price includes admission to the festival, a festival program, a 5oz commemorative taster glass and 9 tasting tokens. Additional drink tokens will be available for purchase for $2 each. So mark your calendar now and maybe I’ll see you in Burien on October 13th. I will be at the festival, working the Northwest Brewing/Flying Bike Cooperative Brewery booth. The Yakima Valley in Washington is one of the most prolific hop growing regions in the entire World. Hops from this region are used across the U.S. and around the World to help create some of the beers you know and love. This time of year, we’re fortunate to have a plethora of ‘fresh hop’ beers available to us due to the annual hop harvest. To celebrate that harvest and all the fresh hop beers that come along with it, the 10th Annual Yakima Fresh Hop Ale Festival will be held tomorrow, October 6th in downtown Yakima, Washington. Most of the time, the hops used in beer production are dried in a kiln before being used for brewing. Fresh hop beers, on the other hand, are beers where the hops are added in ‘fresh’ (just picked) form. They can have a distinctly different character than other, similar styles (like hoppy pales or IPAs). 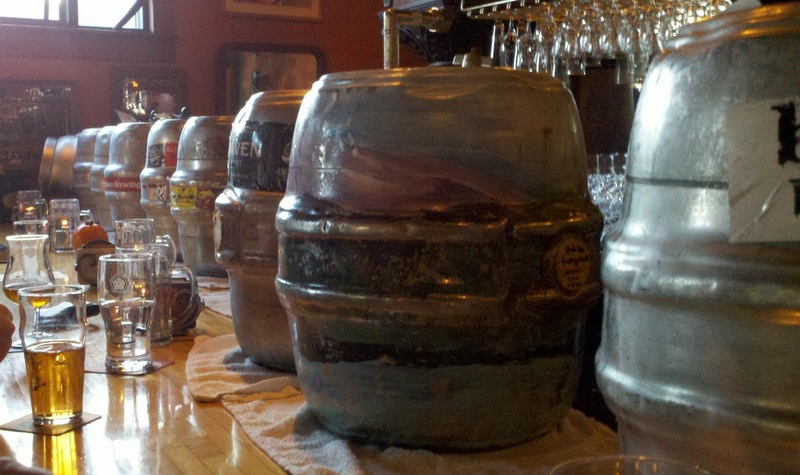 Several have already been available on tap around the Puget Sound over the past few weeks. Perhaps you’ve come across a few? Two of my local favorites this year include Fremont Brewing‘s Cowiche Canyon Fresh Hop Ale (Overflowing with the pleasing flowery and citrusy aromas and flavors of Simcoe and Citra hops) and Two Beers Brewing’s Fresh Hop Ale. This premiere Washington beer festival celebrates the world’s number one hops producer, the Yakima Valley. 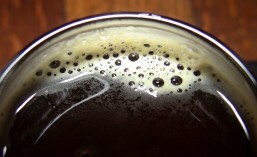 For a brew to be considered a “fresh hop ale” for the festival competition, it must be produced with hops that were picked no more than 24 hours prior to brewing. Now that’s what I call fresh! So if you missed Hopfest at Brouwer’s Cafe, or you’re just in the mood for another serious hop onslaught, I suggest you head out to Yakima tomorrow to drink in your fill of delicious fresh hop beers. Airways Brewing out of Kent, WA has just announced that their Imperial Stout, Final Departure, will become their first ‘packaged’ product to hit the market. Up until now, Airways brewing beers have only available on tap or at other taprooms around the Seattle area. I guess if you’re going to bottle your first beer ever, you want to get it done before the ‘End of Days’ arrive! KENT, Wash. (October 4, 2012) – Beginning today, Seattle and Tacoma-area craft beer lovers and prophecy enthusiasts can begin stocking up on Airways Brewing Company’s® Final Departure Imperial Stout™. The first packaged offering from the growing microbrewery – located just south of Seattle in Kent – Final Departure was brewed as a nod to the fast-approaching end of the Mayan calendar known as the “end of days” on December 21, ensuring the last beer you enjoy is one you’ll never forget. Final Departure will be available in 22-ounce bottles throughout the Seattle and Tacoma area at select specialty bottle shops – including 99 Bottles, Special Brews, Full Throttle Bottle, Beer Junction, Dog and Pony, Beer Authority, The Red House, Malt and Vine, Pint Defiance, Vashon Thriftway and more – now through December 21. For those who prefer to have their last beer be a draft one, Airways Brewing Company will be hosting an “End of Days” party on December 20 at the Airways Brewing Tap Room in Kent. Open from 3 pm to midnight, those anxiously waiting for the clock to strike midnight will enjoy three versions of Final Departure on tap – including the original, and two special versions aged in rum and whiskey barrels – plus Airways Brewing seasonal offerings and more. For more information about Airways Brewing, Final Departure or the “End of Days” party, be sure to follow Airways Brewing Company on Facebook and Twitter, or visit www.airwaysbrewing.com. So, be on the lookout for Final Departure Imperial Stout at your local bottle shops soon, and don’t foget about their “End of Days” party on December 20th at the Brewery. Congratulations to Airways Brewing on the launch of their first bottled beer. Cheers!